This is my first Szechuan Sauce, guys. I have been wanting to post this recipe for a long time and finally found space to do so. Takeout-ish Food, At Home. I actually haven't ordered 'Chinese takeout' in a really long time. I think the last time was probably way back when we lived in NYC, when I wanted a giant container of veggie noodle soup or steamed veggies with brown rice. It usually arrived by bike in a matter of minutes. Ahhhh, the NYC food delivery scene is definitely legendary. But here in LA, delivery is more of a special treat for ultra-lazy nights. And Postmates definitely doesn't have the speedy charm of those NYC bike dudes. But Szechuan flavors have been on my mind to post here on the blog. And I like saying Sze-ch-uan. Se-SHOE-on. Right?.. So why the sudden and intense Szechuan craving, Kath? Well you see, I can only point it to one reference point: Disneyland. Say what? Yes. ..Over the past few years, whenever we find ourselves at Disneyland, we have an absolute FAVE spot to get dinner. Lucky Fortune Cookie. I know, I know, the vegan Gumbo in New Orleans Square is great and there are a bunch of vegan options now. And Dole Whip is always a fave. And Carthay Circle is really awesome for fancy food. But for cheap eats in the land of 'nothing here is cheap.' I love Lucky Fortune Cookie. LFC is located in the outdoor food court right next to Cars Land and the (new) Pixar Pier. Haven't seen it yet, but I know it is there and waiting. Of course as I write this, Disneyland may have already changed something else .. maybe Lucky Fortune Cookie is gone. They have been changing things swiftly lately! I mean, Bugs Life Land is gone (so sad.) But I digress... Lucky Fortune Cookie serves up my fave vegan meal in the park. It is super cheap and super satisfying. What is it??? 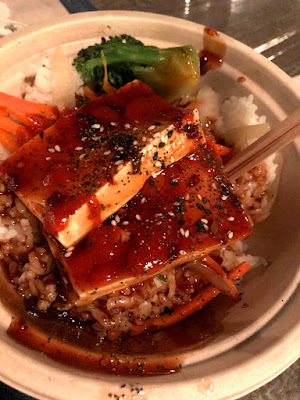 It is a warm little bowl of sticky rice, tofu and veggies - all coated in your fave spicy sauce. They used to be served in cute little takeout containers, but they stopped doing that for some reason. I just love that simple meal! Veggies. Rice. Tofu. Ready to Make Sauce. I love that this recipe uses ingredients that I usually already have in my fridge. I hope that is true for you too. The one thing you might have trouble finding in your pantry is the arrowroot powder. You could use corn starch in it's place. But one of those two ingredients is necessary to achieve the thick "dipping sauce" style texture. I added the mandarin oranges at the last minute because I felt like my sauce needed some fruity layer of flavor and boom. They really did the trick. Serving Suggestion. 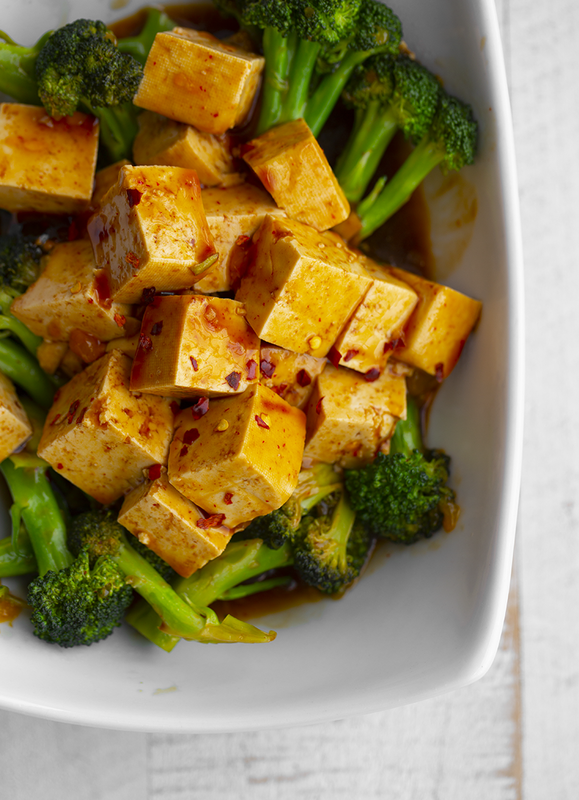 I think the ultimate way to serve this sauce is over broccoli and tofu - (sticky or brown rice would be a great bonus component for a full meal.) 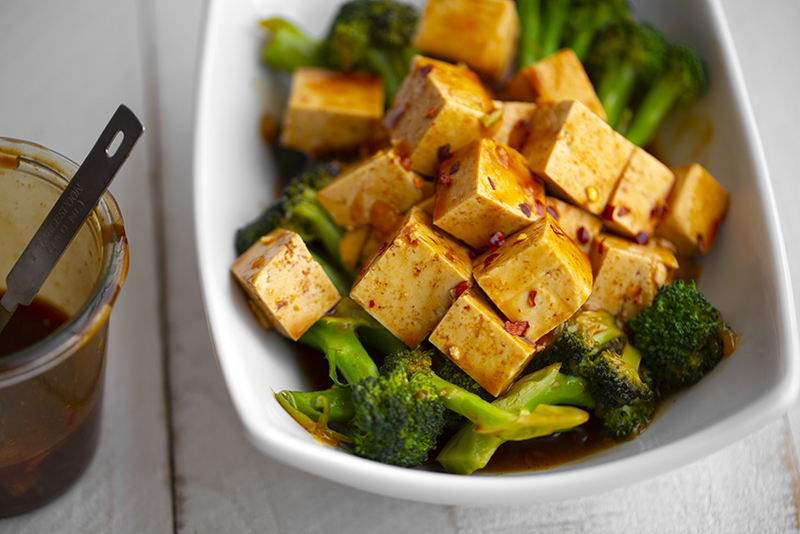 The sauce marinates into the tops of the broccoli, like little sponges. And the tofu is perfectly coated as well. Other yummy adds could be chopped kale, roasted sweet potatoes, green beans or roasted cauliflower. 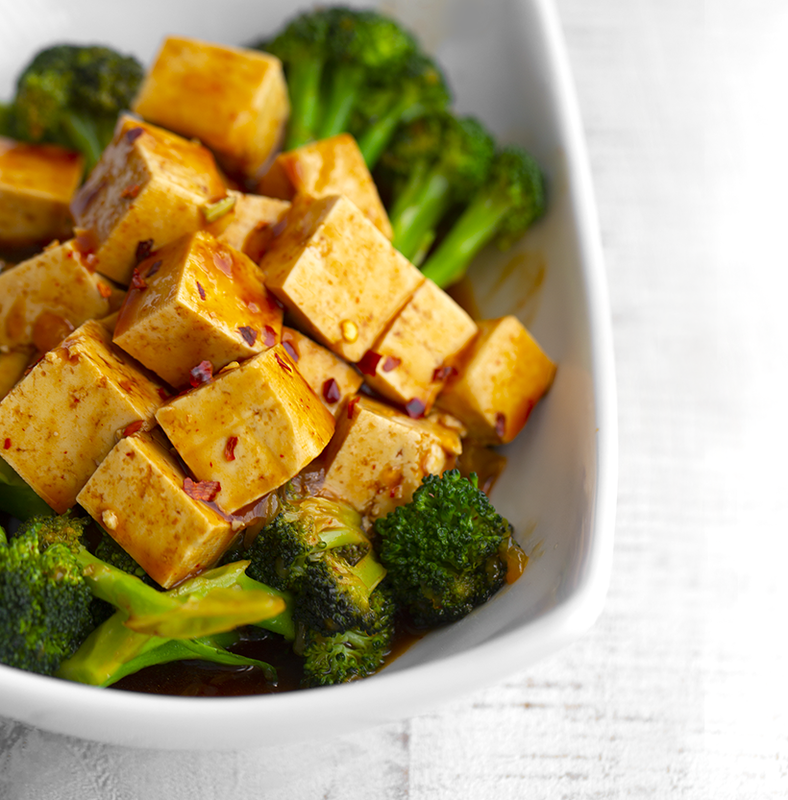 Broccoli + Tofu Instructions. The prep I did for the photos shown was super easy. 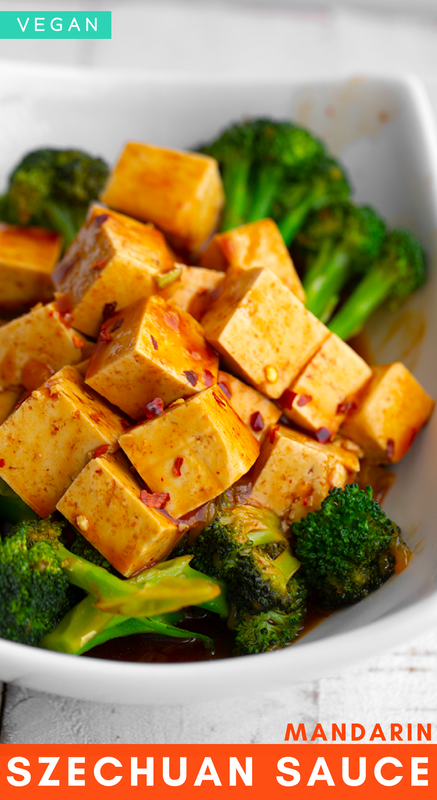 I simply steamed the broccoli, then added it along with the tofu cubes to a large skillet - along with about 1/2 cup of the sauce. 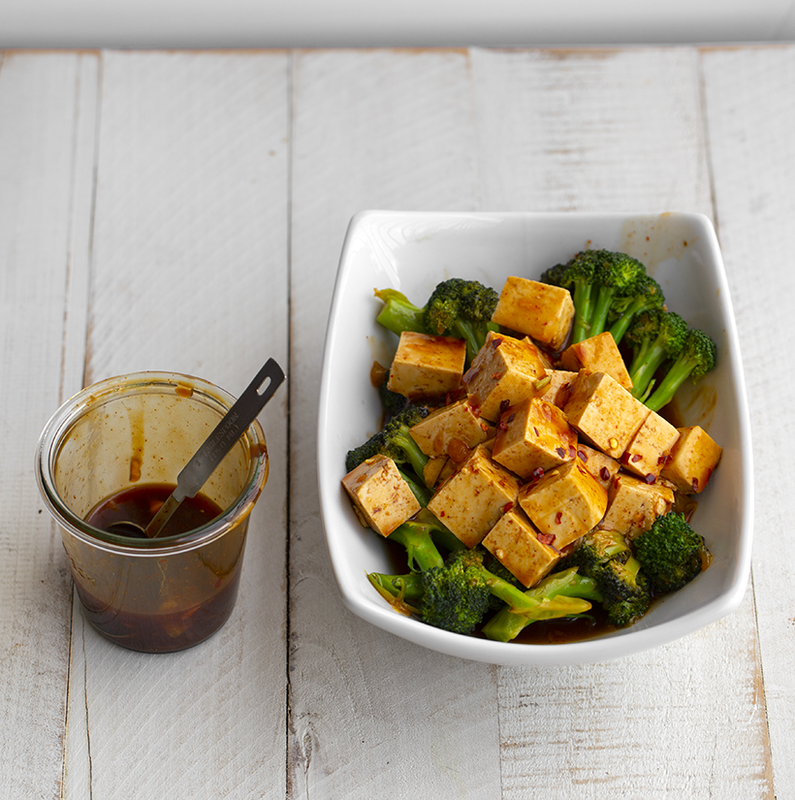 Then I let that saute on medium for a few minutes just to allow the sauce to marinate the tofu and broccoli a bit. Then I served warm. This would have been delicious (and more filling for like a dinner meal) served over fluffy rice or quinoa. As is, this is a great lunch dish! How Spicy Do You Want it? I only add about a half teaspoon or so of red pepper flakes because, even though I love spicy foods, I think the sriracha, ginger and garlic actually add a good amount of warmth. So red pepper flakes really just turn things up a few notches. Depends on your mood. If you are in a SPICY mood, add more red pepper flakes and boom. Flames. Spice. Heat. 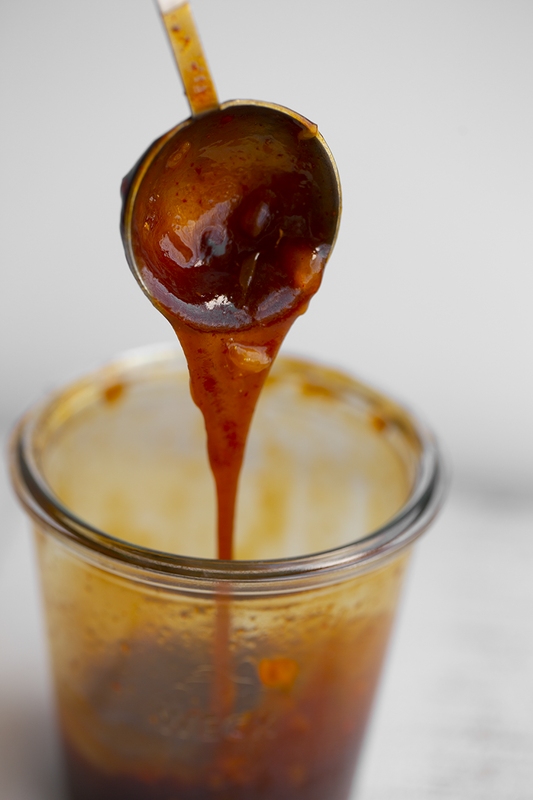 This spicy, sweet Szechuan Sauce is a powerhouse of flavor. Savory meets sweet with garlic, pepper, mandarin orange and sriracha flavors. 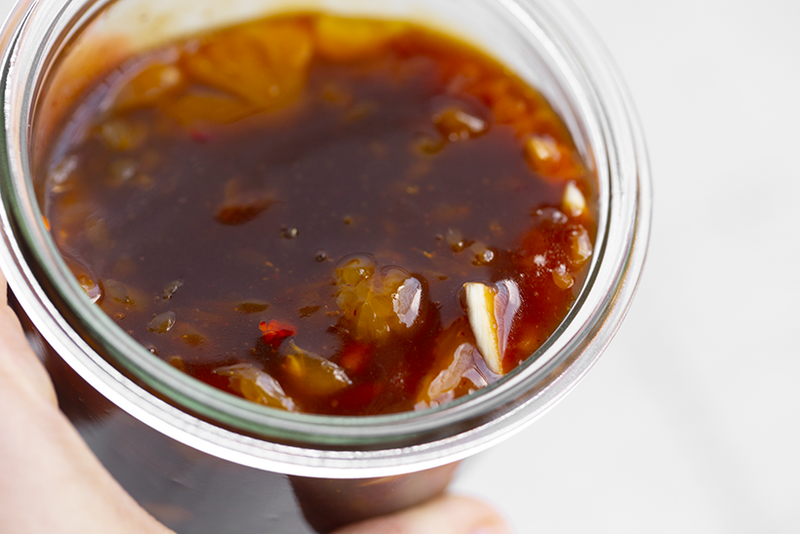 Add the vinegar, sriracha, tamari, agave, oil and water to a small sauce pot. Add the arrowroot or corn starch. Briskly whisk until the powder is dissolved. Stir in the garlic, ginger, red pepper flakes and oranges. Note: a bit of the juice from the can can be added along with the whole oranges - but you mostly just want 1/4 cup mandarin orange slices. Turn heat to medium and continue whisking as the mixture warms. Allow the mixture to come to a slow boil and whisk for a minute. Then reduce heat to low and allow to bubble for a few more minutes. Stirring ever few seconds, still. The mixture should be nice and thick now. If the mixture seems a bit thin, you should cook at a higher temp for a few more minutes - stirring or whisking consistently. Pour the sauce into a small sauce bowl. Serve as desired, right away, or place in the fridge until ready to use. This sauce should keep for a few days in the fridge - however I doubt it will last that long when serving over top veggies, rice or tofu! Delicious! * To make the sauce thicker, add more arrowroot or corn starch. Just be sure to whisk in the starch when liquids are cool, or the starch will clump and not always dissolve properly. * You can try subbing in apple cider vinegar in place of the balsamic, if needed. Adapted from: this copycat recipe. Ha. I mean, I feel like McDonald's does know how to make sauces flavorful. I of course did some major tweaking of my own.